Fair Oak Farm01435 884122work Self-cateringGrade II listed farm house and farm buildings eco-lodge tree houses and shepherd huts, nestled in a 12 acre country estate in Mayfield, East Sussex, sleeping up to 36 guests. Each accommodation with own kitchen and living space. We also have our large barn with large projector screen and meeting facilities ideal for corporate meetings and also perfect for large family gatherings where everyone can gather to cook, dine and relax. 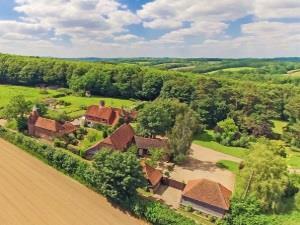 Surrounded by the stunning countryside yet only an hour from London (Stonegate station 2.5 miles). Chef and on site activities available. London Gatwick airport is approx. 35 mins and London Heathrow is approx. 1hr 30 mins by car, depending on when you travel. By road from M25 junction 5 follow A21 into Tunbridge Wells. Take the A267 out of Tunbridge Wells, follow signs to Frant, Mark Cross and Mayfield. Go through Frant and Mark Cross. Turn left onto Fletching Street, sign posted to Mayfield. Enter the village and turn left on to East Street, past the School. Turn right on to Scotsford Hill. Turn left on to Witherenden Road. After 1 mile Fair Oak Farm can be found on the left. Time to breathe in the country air! By rail Stonegate station is 5 minutes from Fair Oak Farm (1hr 10mins from London Charing Cross). Alternatively Crowborough station is 15 mins away (1hr from London Bridge/Victoria). Prior to or during your holiday in the country we can supply you with more detailed maps and directions on request. Our OS map reference is TQ 622 262. Some bedrooms, dining room, lounge, bathrooms and kitchen fo not have fitted carpets.